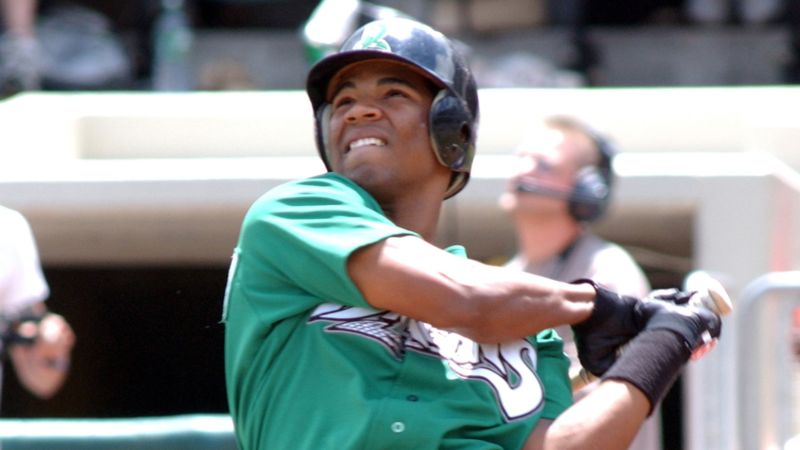 Encarnacion joined the Dragons late in the 2001 season after being acquired in a trade with the Texas Rangers earlier that summer. He then spent the entire 2002 season with the Dragons in his first full season in the Cincinnati Reds organization at the age of 19. Encarnacion represented the Dragons in the 2002 Midwest League All-Star Game and was named as the third baseman on the MWL Full-Season all-star team. He played in 136 of the Dragons 140 games, batting .282 with 17 home runs (tied for fourth most in the league) and 73 runs batted in. He also stole 25 bases. Encarnacion made his Major League debut with the Reds in 2005 and emerged as the team's starting third baseman the following season when he became the youngest player to start at third on Opening Day for the Reds since Dan Driessen in 1974. By 2008, Encarnacion began to show the kind of home run power that would become his trademark. He hit 26 homers for the Reds that season before being dealt the following year to Toronto in a trade that brought all-star third baseman Scott Rolen to Cincinnati. Encarnacion belted 42 home runs for the Blue Jays in 2012, starting a still-active streak in which he has hit at least 30 homers in seven straight seasons. He is the only big league player to finish in the top 10 in home runs in his league in each of the last seven years and now ranks third in career home runs among active players with 380, trailing only Albert Pujols and Miguel Cabrera. He ranks 71st in baseball history in career home runs, second only to Adam Dunn among former Dragons. He has played in three Major League all-star games, tied with Jay Bruce for the second most among former Dragons, trailing only Joey Votto's six all-star appearances. He left the Blue Jays after the 2016 season ranked third on the team's all-time franchise home run list. He spent the last two seasons with Cleveland before being traded to Seattle in December. Encarnacion is the 12th player announced among the 20 Greatest Dragons. Austin Kearns, Zack Cozart, Justin Turner, Homer Bailey, Samone Peters, Devin Mesoraco, Didi Gregorius, Tucker Barnhart, Todd Frazier, Wily Mo Peña, and Jesse Winker were previously announced.